Jesse Stine is the real deal; he lays out the proof candidly throughout this superb book. I love the real life examples he shares with us, not only about trading and investing, but about his travels, health & wellness, etc. Having proper balance in your life is required to become a successful investor. You will glean so much from this book and I’m positive it will open your mind to new ideas and improve your investing abilities. Thank you so much for writing this book and sharing your knowledge and experience with us! PS. love the quotes throughout the book. Go Buy This Book Now, You Certainly Won’t Regret It! “Jesse’s story is one of remarkable achievement. What is most impressive about this book is the mindfulness with which he shares his craft. His approach is to educate by relating examples and key principles from his investing success, and it is done with an honesty and awareness that differentiates “Insider Buy Superstocks” from other classic investment books. Jesse Stine has never held a job on Wall Street. He is not on the financial speaking circuit. Against the advice of his marketing consultant, he does not have a blog or a promotional Facebook page. He does not wear a suit and he definitely does NOT appear as a regular guest on CNBC. Jesse is an unconventional stock trading cowboy. During his career, he has had short-term account drawdowns of 61%, 64%, 65%, 75%, 100%, 100%, and 106%. In spite of his drawdowns, in non-overlapping periods during his career, he has had short-term (less than 1 year) personal portfolio gains of 111%, 117%, 156%, 264%, 273%, 275%, 300%, 371%, 1,010%, 1,026% and 1,244% (these last two in the same period- 7 months and 11 months, respectively). Jesse is a diabolical student of market history as it relates to uncovering the market’s biggest gainers. His religious principles are independence of thought, visualization, and confidence….as they relate to financial markets. In a past life, Jesse studied Economics at Emory University in Atlanta, Georgia. He received his MBA from Georgia State University in Atlanta. Over the years, Jesse has spent considerable time in developing nations. He has lived in or traveled throughout China, Laos, Vietnam, Indonesia, India, Tanzania, Kenya, Uruguay, The Philippines, Malaysia, Ecuador, Colombia, Venezuela, Chile, Peru, Costa Rica, Brazil, Mexico, Macau, Argentina and Cambodia. He has also spent time in more mundane locales such as Singapore, Iceland, South Africa, Hong Kong, Japan, The Bahamas, Australia, Canada, and much of Europe. 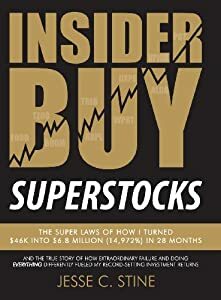 Jesse’s remarkable personal journey and 16-year courtship with the financial markets are detailed in his book “Insider Buy Superstocks”.